Can cities be places where people flourish? Before we can answer this question we need to define what we understand by human flourishing. The UN predict that by 2050, two-thirds of the world’s population (around 6.4 billion people with the world’s population at approximately 9.6 billion) will be living in cities. The majority of the growth will take place in Asia and Africa. Currently there are 28 mega cities with over 10 million people, by 2050 there will be 41 with Tokyo having the largest population. But what will the quality of life be for those 6.4 billion? Of which, if I’m still alive I’ll most likely be one. By 2050 I’ll be 76. So I wonder what will Melbourne be like? What will all the services be offering? Will there be any cars in the CBD? Will there be a CBD? What will shopping, healthcare, education, the media be like? What will technology have given us? Where will the gathering places be? How will community be formed? What are the guiding principles that will not only ensure sustainability, but lead the way for human flourishing? Cities are often seen as negative places, devoid of natural environment, without a soul and so forth. I don’t buy it! I see incredible potential for cities to be places of light, hope, of new beginnings and endless possibilities. However we need to ensure they are places where EVERYBODY can experience those things. This will involve some major re-thinking about how our cities develop and what we see as important as we experience growth. Perhaps even the economic agenda needs to be displaced from its position of privilege and replaced with the relational or community agenda as the central guiding principle. If this is achieved, the door is open for a sustainable economic future that we can all participate in. In a step towards this, last year the City of Melbourne put on a conference called Beyond the Safe City. Internationally Melbourne has been recognized as a safe city, but they wanted to go further to look at places and spaces for human flourishing. The input from professionals in their field was outstanding. We were able to explore the benefits of social entrepreneurialism, explore what event theory had to offer CBD hotspots and look at cities, Melbourne in particular from a number of different angles. The desire of the conference was for everyone to feel safe in the heart of Melbourne. One of the standout examples was the hospitality (creating space for the stranger) shown by Urban Seed and the care they take with building relationships with people who frequent their laneway. There was encouragement for people who live in other laneways to offer similar hospitality rather than shunning those who are different in some way. 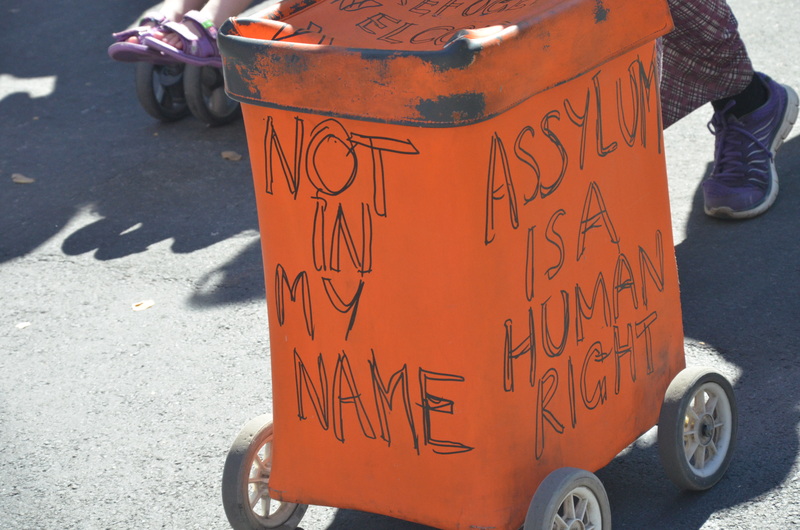 On Sunday Melbourne had another opportunity to show hospitality and its willingness to make space for everyone to flourish. 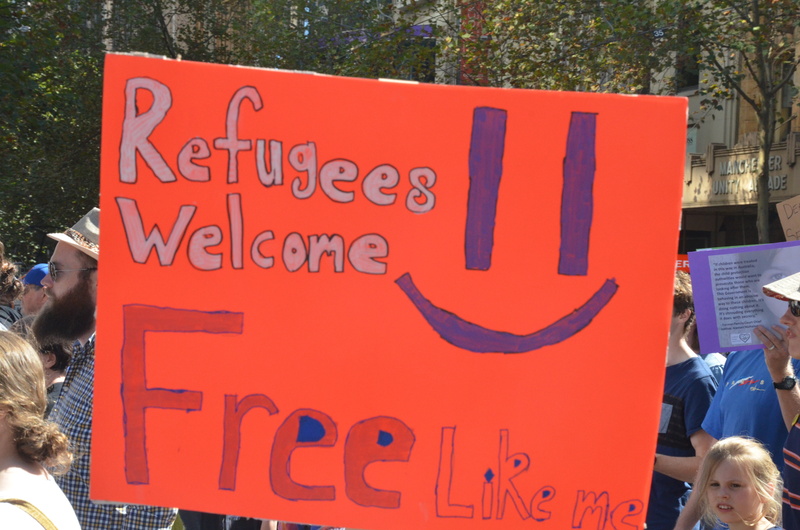 It was the Palm Sunday March for Refugees. 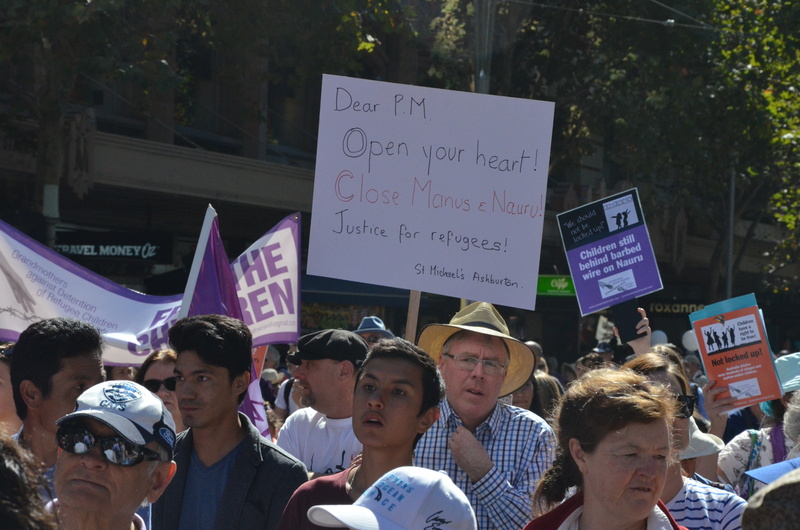 Over 10,000 people turned out in force with banners waiving showing their support for refugees, pleading for children to be let out of offshore detention, showing their dissatisfaction with current government policy and demonstrating that all are welcome in our city. One of the things that struck me was the diversity of people in the crowd. Many arms of the church were present as was the Humanist Society, medical professionals and countless local refugee groups. It seems that this kind of issue around human flourishing transcend the usual sacred / secular divides. 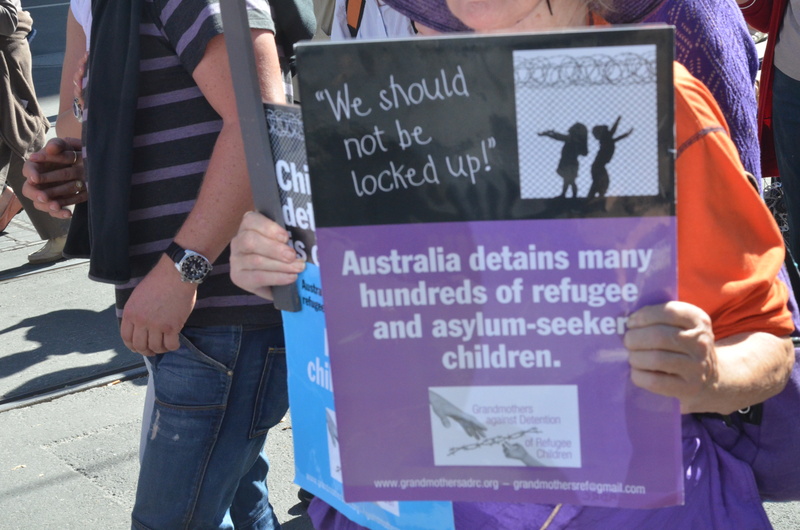 Can we celebrate the thousands that turned out to the march that stretched from LaTrobe Street all the way Flinders St Station? More can we celebrate the spirit in which they turned out? The welcome they offered? And I believe the sacrifices that many of them would be willing to make to bring their statements about refugees into actuality. This is the kind of spirit of openness we need to display to each other in order for Melbourne to be a place where everyone can flourish. The UN fact sheet on population from August 2014 states that sustainable urbanization requires cities to generate better income and employment opportunities; access to clean water and sanitation through the expansion of the necessary infrastructure; transportation; information and communications; equal access to services; reduction in the number of people living in slums and the preservation of natural assets. However, is sustainable urbanization enough to ensure human flourishing? I have a suspicion that human flourishing has to do with belonging and meaning or purpose. If someone feels they belong to a place or a people this opens the door for them to explore more of who they are and to begin to discover and live out their purpose. Sadly with isolation in Melbourne increasing many do not get to experience either. The United Nations’ list of what constitutes a sustainable urban environment is important, yet how these things are developed in concert with a sense of belonging, individual and community empowerment and a lived out purpose becomes crucial to human flourishing. In the past cities tended to be developed in silos. The silo mentality is still alive and well in many of our institutions. Through working alongside local councils I have discovered that quite often it is difficult to get the planning department to talk to the community department and vice versa. Yet these types of conversations and the relationships behind them are vital if municipalities and cities are to be developed well. These relationships need to be formed not only within the institution of local government but across the different spheres of a city. For example what would it mean for the development of a city if there were vibrant relationships between the spheres of politics, health, education, sport and recreation, business, community service organisations (not for profit), media, Arts, Justice and Law? What creativity and innovation could be released through this sort of cross profession and multi-disciplinary conversations?